George Keremedjiev is president of Tecknow Education Services, Inc., Bozeman, MT; 406/587-4751, www.mfg-advice.com. Mentoring is part of the hands-on training that operators undergo at Larsen & Shaw. Mastery of an effective ERP program. A family-owned business since 1919, Larsen & Shaw employs some 100 people in its Walkerton facility; it also operates a newly opened plant in Rome, GA. Its metalforming and assembly specialties include production of custom, standard-continuous and architectural hinges, as well as other varieties of stamped metal products, including hardware. “’We’ve come a long way,’ are the words I would use to describe our progress on the subject of in-die sensing, inhouse technical training and ERP utilization,” says Mary Jane Bushell, president and CEO of Larsen & Shaw, in describing the company’s journey to productivity excellence. Having had the pleasure of watching her company successfully navigate the path to manufacturing excellence, I can truthfully attest to this. For, just a few years ago, die crashes, part-quality issues, lack of skills training and massive paperwork bottlenecks were the norm at the company. Today, all of that is a distant memory for Bushell and her team. Classroom training at Larsen & Shaw encompasses 11 core modules developed inhouse supplemented by several advanced technical-training modules. Here, shop-floor workers take in a class on coil-feed setup. The company’s first step toward worldclass manufacturing: implementation of a full-time sensor-applications expert position, with a full error-proofing sensor laboratory for research and development. The goal was to develop digital (die protection) and analog (in-die part-quality measurement) sensor applications. Many of the company’s hinge-stamping dies incorporate complex tooling stages in order to achieve tight-tolerance part geometries. In just a handful of years the company has truly mastered, to the highest global standards, digital and analog sensor applications within its tooling, and has spread this wealth of sensor expertise throughout the rest of its shop-floor manufacturing processes. 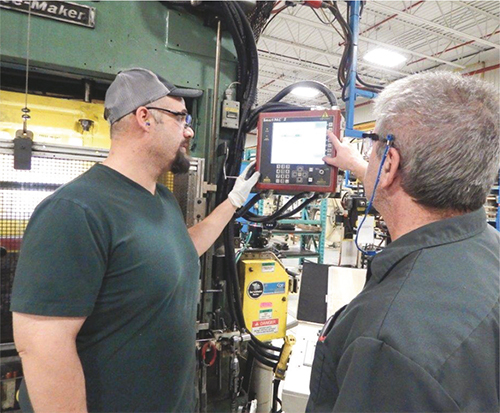 It just makes sense that the lessons learned from implementing an error-proofing sensor program to prevent die crashes carry forward throughout the rest of the company’s manufacturing processes, including assembly. Finding skilled manufacturing help is a challenge throughout the United States and Canada, as baby boomers retire with few if any new replacement employees being formally and thoroughly trained on the requisite retiring skills. And, Larsen & Shaw is no exception. To address this concern, the company created an internal school to grow its own manufacturing talent from within. 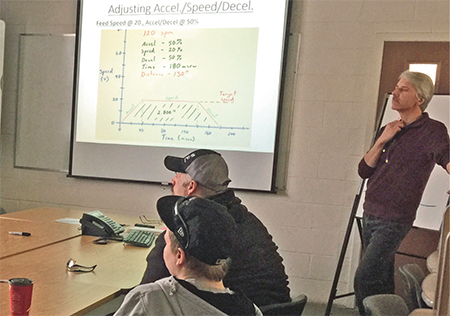 “As a well-established family-owned company with a very dedicated, rural workforce,” Bushell says, “we lacked a formal technical training program for much of our history. The management team viewed this as a major threat to our ongoing sustainability. So, in 2011 we began to invest heavily in training. It is fair to say that for the vast majority of the company’s history, training was a serious weakness. Within the last few years, it has turned it into a strength, “which helps me sleep much better at night,” Bushell adds. The proper selection of manufacturing employees is more important than ever as various computer technologies become mainstream on the manufacturing floor. Finding truly trainable metalforming and assembly employees can prove difficult for many companies. At Larsen & Shaw, a new ERP system helps overcome this ongoing challenge. “We have developed a robust candidate-screening process, orientation and technical-training programs,” Bushell says. “And, we have tied it all together with the help of our ERP system (Plex, implemented in January 2015). With Plex, for example, we can document for any given position the various steps in the required training plan, using a work-flow process. This provides online visibility of an employee’s progression through the plan, and allows us to provide assistance when necessary. I often ask shop-floor workers and managers to share their thoughts on their employer’s progress toward worldclass manufacturing. Here are some observations from various employees at Larsen & Shaw.